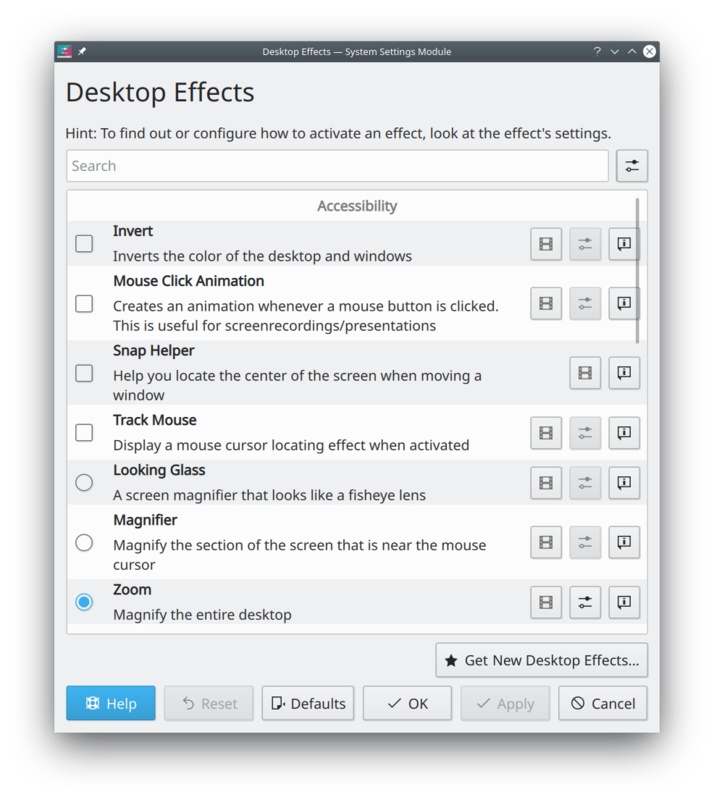 I totally missed that last week marked the one-year anniversary of my documentation and guidance of KDE’s Usability & Productivity initiative. I think we’ve achieved a lot over the course of that year! Note that this is NOT an exhaustive log of everything that happened this week in the entire KDE community, or even in all of Plasma. The actual number of commits and improvements is always vast and enormous–too much to comprehend, really. The KDE Community is staggeringly productive. One design item I absolutely hate is the scrollbar that overlays over content. (as shown in the Desktop Effects screenshot). Seriously wanting to understand where it comes from: what is the rationale behind it? It makes for a tricky cursor scrolling. Awesome! I’m really glad for Ocular’s annotation feature which was so lacking. By adding this, Ocular is stepping in into the professional league (that is usually proprietary, I never saw FOSS pdf app to have that feature till now!) where this was a must-have. I hope that it will let me use visual stamps without a certificate (not all need real sign-in and regular stamp or signature is enough). Anyway, exciting change! Do radio buttons still act as checkboxes, ie. to disable an effect you have to click on the active radio button? Oh my goodness, I did not understand what you meant, but now I see. Yes, that is still a bug. I didn’t even know it did that. 😦 I’ll see what I can do. Hi Nate, can you please avoid to hide multiple bugs in a sentence like “received a visual overhaul, fixing many bugs in the process”? This might work acceptable on a desktop, on a mobile with a touch screen the bugs are not distinguishable until I open them. But thank for the great weekly posts! Great news, another week fantastic as always Nate. I only would like to see the keyboard shortcut by default on KWin, Meta + Arrow Keys, as i read about 8 months ago or so, previous to the launch of Plasma 5.12 LTS, if i remember correctly, it was that KWin would bring by default, the keyboard shortcuts activated for the windows control, such like it’s on Windows (Meta + Upper Arrow Key to maximize the window, etc), that would be awesome in my humble opinion. Thanks as always for your fantastic and amazing work Nate and of course, everyone at the KDE project that made this terrific software possible. In fact, those already exist starting in Plasma 5.13. Kubuntu backported them to 5.12, but I’m not aware of other distros that did this. I’m on Arch Linux, with Plasma 5.14.5, but i can’t use it. Try resetting your shortcuts to the default settings in System Settings > Shortcuts > Defaults. Hmmm, yeah, that worked for me, really thanks. Interesting, it improves greatly Plasma use with the keyboard for me, but the action Meta + Up arrow only tiles to up, on Windows it maximizes. I saw it, but yeah. What let me frozen was that i reset to defaults, and that changed the Alt + Tab keyboard shortcut to cycle between open windows. Thank you very much Nate. All of these shortcuts are changeable in there, BTW. By default Meta+PageUp will maximize, but you can change it to Meta+Up if you want! Yeah, i know it. That’s one thing i really love from KDE Community, KDE Software and Plasma in particular, with KWin being the rockstar here. I saw that and it’s really nice. Hi, is it possible that Okular can get pages from the scanner, so to make them as an only one document? thanks. Am I the only one irked about this behavior on dolphin? when you hover over a file, the information about name, file type and size sticks around for a few seconds, I don’t mind this if there’s no file selected, but when there’s an element selected I’d rather have the information about the selected file immediately as long as we aren’t hovering anything else. To explain better, let’s say I have selected element A and hover over element B, after unhovering element B it doesn’t instantly change the information back to element’s A, by informaiton I mean name,file type and size displayed at the bottom bar of dolphin. Also, I found an issue with a kde widget that I think is aprt of the system which shows system load as a bar or a circle, the problem is that the width of the graphics seems to be taken from the system’s font size rather than having a setting for the width, this also means if we want to make it thinner or wider we have to change the font size for everything. I agree on everything, if then the problem of the title panel is only aesthetic, setting the panel with the same color of the window you also get a nice effect, I personally do it always. It is possible to do it manually by changing the color theme or if you use Breeze it is possible from Color to install Breeze Light that does just that and the result is excellent, so that in my opinion it would be good to set it by default, it is so if you use Breeze Dark , so I can not see why not do it with the Light version. Then, I think I will this as two bugs : one for the forgetting the position, and second for lack of script/dbus support. For good measure, I filed https://bugs.kde.org/show_bug.cgi?id=403410 too.